What should my first small business marketing plan look like? For many small businesses, marketing is an optional thing that you do if you have extra money, which often is not the case. Now that doesn’t mean that they don’t spend money on trinkets and sponsor the local baseball team, its just that they don’t put together an intentional effort to market their business. If working your network and getting referrals has been bringing you as much business you would like then maybe this is ok. However, if you would like to gain more leads and become known for what you do outside of your current professional network, then an intentional marketing plan is likely in order. Anyone who has taken a business marketing 101 class just got a pit in their stomach while reading that because the traditional effort to build a marketing plan can be a long arduous task of creating that thick binder that sits on the bookshelf and is never referenced again. I am going to suggest that it doesn’t have to be for the small business purpose outlined above. Let me be clear that I do believe in the sections of a traditional marketing plan such as your SWOT analysis and competitor analysis, but for the purpose of building your first plan, I believe it is important that you can achieve it quickly and that it can be fluid as your needs change. This plan should have 3 basic components: 1) The message 2) the activities and 3) the timeline. I like grids since they limit how much you can write in each cell so I would use a Table in Microsoft Word or a spreadsheet in Microsoft Excel. Let’s start with the message. 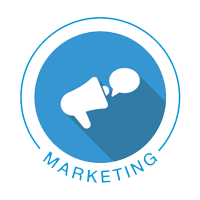 When marketing intentionally, you should try to make all of your activities happening at the same time support a single message that you want the market to receive. For example, if you want them to know that you are an expert in cyber security, then all of your blog posts, advertisements, white papers, etc should be on cyber security for a particular marketing time period. Even if you are an expert in several different things, focus on one at a time to best get that message across to the marketplace. I would write the message at the top of my grid. Down the left hand side of my grid start listing the activities you plan on doing to promote your business. I listed a few above but others could be trade shows, expert panel talks, press releases, promotional items, or other inbound marketing tactics. Once you have listed the activities, determine the timeline during which you want to spread this message. Be realistic about how much you can do and try to spread the activities over a span that will penetrate the audience you are speaking to. This could be building up to or kicking off with a certain event that you are doing such as a celebration or trade show. Indicate the timeline across the top of your grid and then add specific details for each activity in the cells. Most importantly, have a little fun with this. Marketing should be fun and effective and should not give you a pit in your stomach. You love what you do, let the world know about it. Michael Giuffrida from Southington CT has been operating businesses since 1997. He is an experienced entrepreneur in business management, profitable growth, business valuation, mergers and acquisitions, and information technology managed services. This entry was posted in *All Posts*, Getting Started, Marketing, Sales. Bookmark the permalink. ← When is it time to hire my first employee?